This incredible 500 sq m showroom is located in the in-demand area of Champs-Elysées close to Ternes. 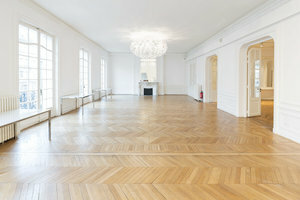 It is a prime location for high-end Fashion Showrooms and Private Events. The space is divided over 10 rooms making it highly adaptable in terms of set-up and the range of functions that can be hosted here. Housed in a Haussmannian building, the space has wonderfully high ceilings and many large windows with create a lovely radiant atmosphere inside the space. Classic interiors of white walls and original parquet floors with antique fireplaces give this space a sophisticated and quintessentially Parisian feel. Advantageously located in an area that is very popular during Fashion Week and is highly sought after all year round, this showroom presents an outstanding opportunity for brands looking for a premium space.